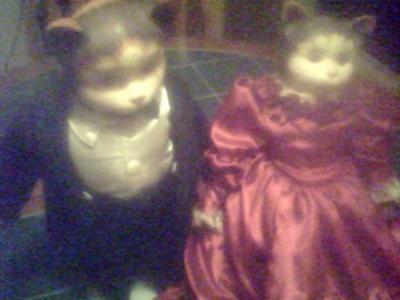 I have a pair of antique Bisque dolls which are cats. I purchased these cats at a thrift shop. I know they are old but that's all I know. One is a female and the other a male. The male has a symbol on the neck with the numbers 00-1658 and the female has a name on her neck which is partially cover with part of her dress with is glued at that point. Both are in very good condition. They are 14" in height. The male has original clothing but not sure about female. Would like to know maker and estimated value?